Nachos for breakfast? Yes, please. These clean eating Pork Carnita Breakfast Nachos are loaded with rice, quinoa, lean pork, eggs and baked tortilla chips. 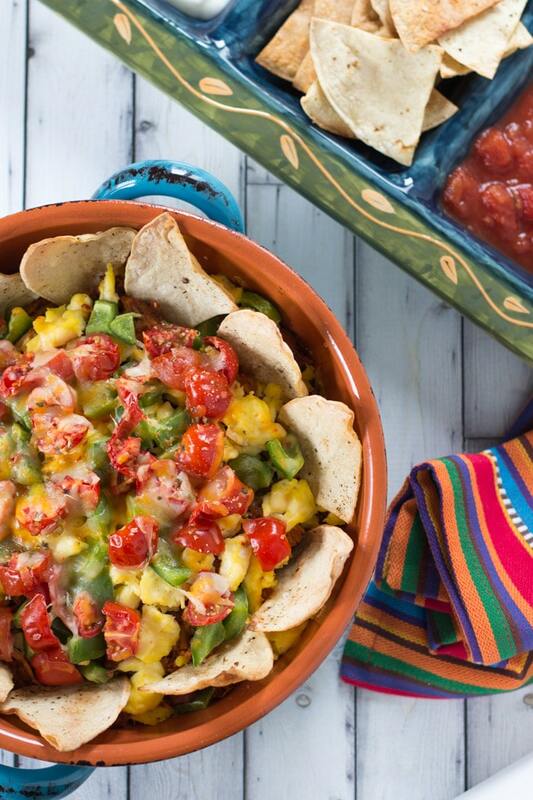 Perfect for Cinco de Mayo, a Mother’s Day Brunch, or even supper tonight! I made these Pork Carnita Breakfast Nachos last weekend when we had friends over for supper, and they were a big hit! So I definitely wanted to share them on the blog this week. 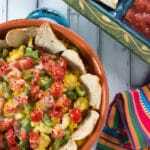 And since this is a Mexican inspired recipe, I thought it was appropriate to share it on Cinco de Mayo. You could make these Pork Carnita Breakfast Nachos for brunch this weekend, or even for supper. This recipe makes a great appetizer or main meal, and who doesn’t like breakfast for supper? 😉 Mother’s Day is also a little over a week away, so this dish could absolutely be added to your brunch menu. I’ll be sharing some more breakfast/brunch recipes next week so be sure to check back for some inspiration. Whether you enjoy these Pork Carnita Breakfast Nachos for brunch or supper, rest assured they are filling and tasty, but not too rich or greasy. For pulled pork recipes, I normally go with a pork shoulder or pork tenderloin (because it is leaner and shreds easily). But for this recipe, I wanted something that was not only lean, but could be cooked quickly and pulled apart into chunks instead of shredded. So I decided to go with centre loin boneless pork chops. I seasoned and slow cooked them for 3 hours, and as simple as that, they were done! The pork is seasoned with a mix of lime juice, spices and herbs. It’s spicy, but a mild spicy. The paprika, cumin, chili powder and ground coriander gives the pork a nice flavour but it doesn’t have a lot of heat. And the coconut sugar adds a tiny bit of sweetness that complements the spice and herb mix. For my first attempt at this recipe, I added hot paprika and cayenne pepper. Now, that brought the heat! We enjoyed it in our house, but I realize some people may not enjoy it that spicy. So I decided to take it out of the recipe. But if you like spicy, feel free to add a pinch of hot paprika or cayenne pepper to the pork seasoning! I suggest marinating the pork with the lime juice and seasoning overnight or for about 6 hours. If you don’t have time, you can just season and slow cook immediately. I actually do this quite a bit (because sometimes you just can’t plan that far ahead! ), and the pork still turns out delicious. If you do this, just note that the flavour won’t be quite as intense. 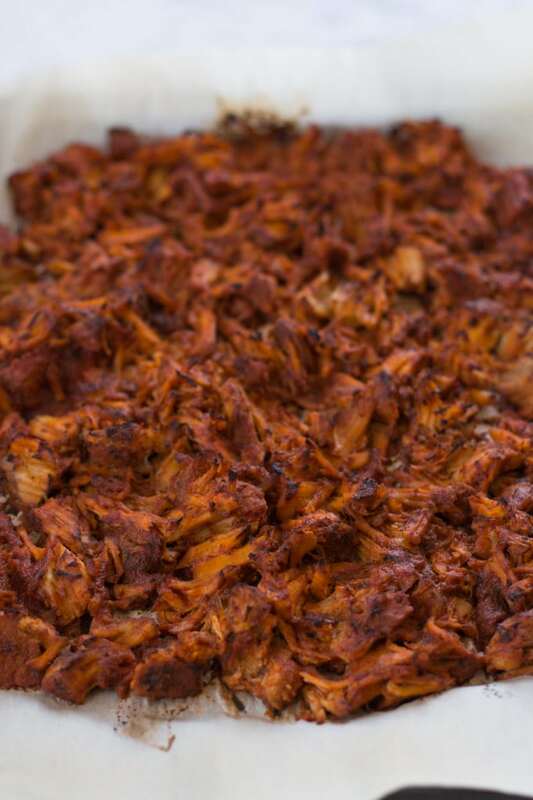 Once the pork is cooked, spread it out on a baking sheet and broil for 10 minutes or so (not too much because the pork will be baked again with the nachos and you don’t want it to dry out). Broiling the pork chars it slightly, and adds a little smoky flavour. It is super tasty! If you wanted, you could stop at this point and just eat the pork as your meal and call it a day 🙂 . But if you want some other food groups thrown in there, read on! While the pork is in the slow cooker, start preparing the rice and/or quinoa. I used a sprouted rice and quinoa blend and cooked it using the trick in this recipe for Turkey Meatball and Quinoa Bowls. I also took this time to scramble the eggs and chop the green pepper and tomato. Once the pork was ready, I layered the rice/quinoa, pork, eggs, veggies and cheese in a large casserole dish and baked for 10-15 minutes. And yes, I snuck cheese in there. I realize tex mex cheese is not exactly clean eating, but nachos need cheese. So I added the cheese 😉 . Now, let’s talk about the tortilla component of these Pork Carnita Breakfast Nachos. You can definitely use store bought tortillas for this recipe. 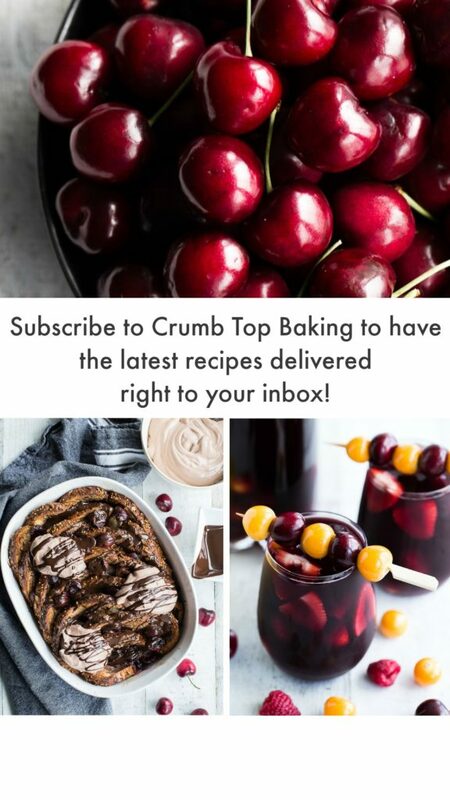 But I wanted to keep this recipe as clean and light as possible. And since there is already a lot of rice/quinoa in this dish, keeping the chips light is a nice balance. So I decided to use the baked tortilla chips from this Sea Salt Lime Tortilla Chips with Creamy Kale Pesto recipe. I made a lot of these chips this past week trying to perfect the recipe, so I didn’t want them to go to waste! I poked these chips into the pork, rice, egg mixture and baked for another 10 minutes. You could also skip this step and serve the tortilla chips on the side. Just make sure you bake the pork, rice, egg mixture long enough so it is heated through. If you make these for breakfast, lunch or supper let me know what you think in the comments below! I’ll be polishing off the rest of this dish for supper this evening 🙂 . These clean eating Pork Carnita Breakfast Nachos are loaded with quinoa, rice, lean pork, eggs, veggies and baked tortilla chips. Enjoy as an appetizer or as a main dish for brunch or supper! Add the pork chops to a large re-sealable freezer bag. Cut the lime in half and squeeze the juice from the lime. Add the juice and the remainder of the lime to the re-sealable bag. In a small dish, combine the thyme, oregano, paprika, chili power, garlic powder, cumin, coriander and coconut sugar. Add to the pork, re-seal the bag and toss to coat. Marinate in the fridge for 6 hours or overnight. Place the pork and the lime in the slow cooker (grease the slow cooker with cooking spray) and pour the tomato sauce over the pork chops. Sprinkle with salt and pepper. Cook on high for 3 – 3 1/2 hours. Once cooked, pull apart the pork chops with a fork and mix around in the tomato sauce. Place a piece of parchment paper on a large baking sheet and spread the pork out on the sheet. Broil for 10 minutes. 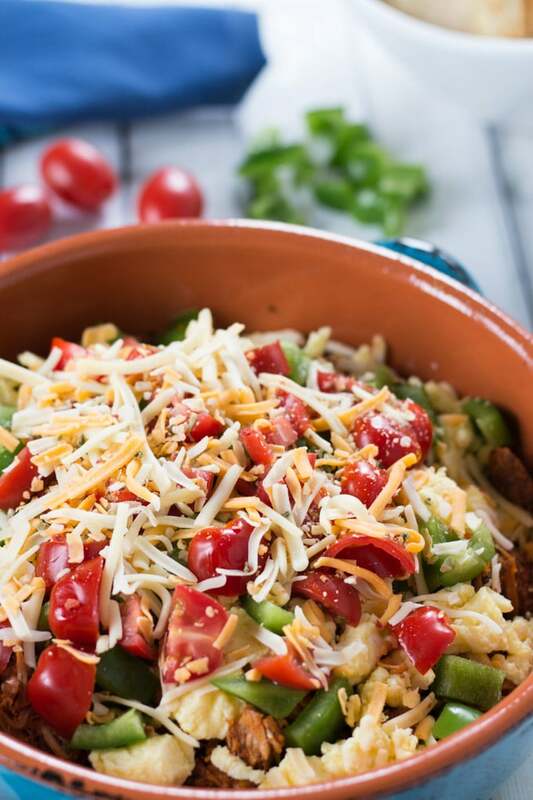 In a large greased casserole dish, add the cooked quinoa/rice to the bottom of the dish and layer with half the cheese. Next, layer on the pork, scrambled eggs, green peppers, tomatoes, and remaining cheese. Bake for 10-15 minutes, or until the cheese is melted. Remove from the oven and add tortilla chips by sticking them in the pork, egg, rice mixture. Bake for another 5-10 minutes. Serve immediately. 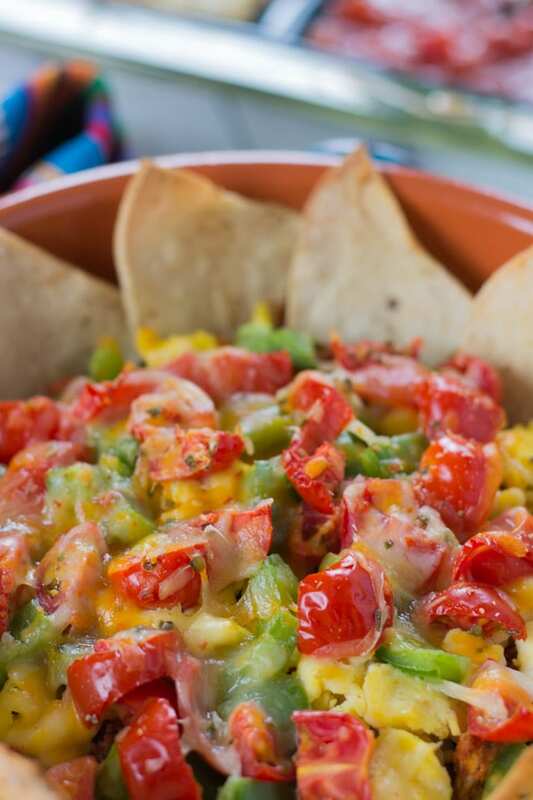 Eat on its own or serve with additional tortilla chips, salsa, sour cream and/or guacamole. The leftover pork, egg, rice mixture can be stored in the fridge for 2 days. The tortilla chips will get soggy in the fridge so eat them all before you store the leftovers 😉 . 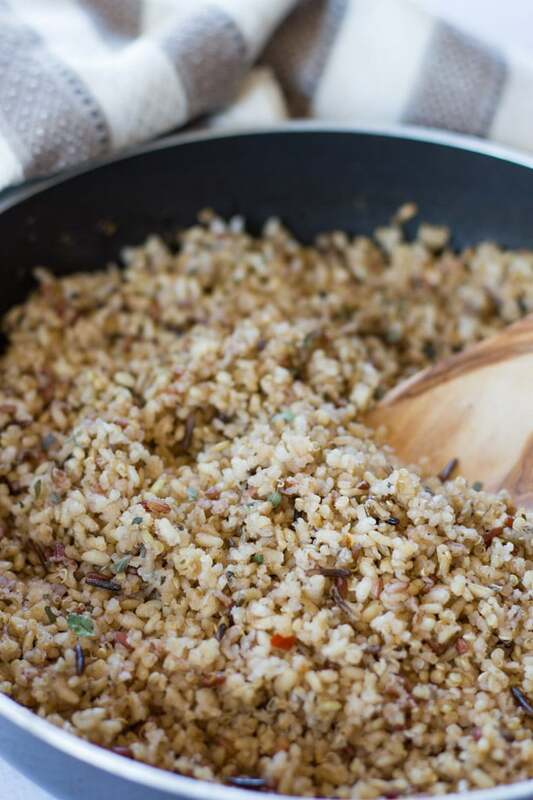 For the sprouted rice and quinoa in this recipe, I toasted it before cooking it using 1 clove of garlic and 1 tsp. of olive oil. (See the process in this Turkey Meatball Quinoa Bowl recipe). I also added a tsp each of oregano and cajun seasoning to the water once I started cooking the rice and quinoa blend. This added a hint of heat, which pairs nicely with the pork. If you prefer, you could definitely keep your rice/quinoa unseasoned for this recipe. Delicious meal. I was thinking of doing this for my food prep and dividing it into equal mini bake portions. There is a perfect combination of carbs and protein in this to keep me full for a long time. Thanks Mark. I love that idea! I actually had a small portion of the leftovers (minus the tortilla chips) on a bed of spinach last night for supper and it was really filling. BREAKFAST NACHOS! How flippin’ brilliant is this. I’m in love. This is so veggie-packed, too. Now THIS is how you start the day. Thanks Dana! 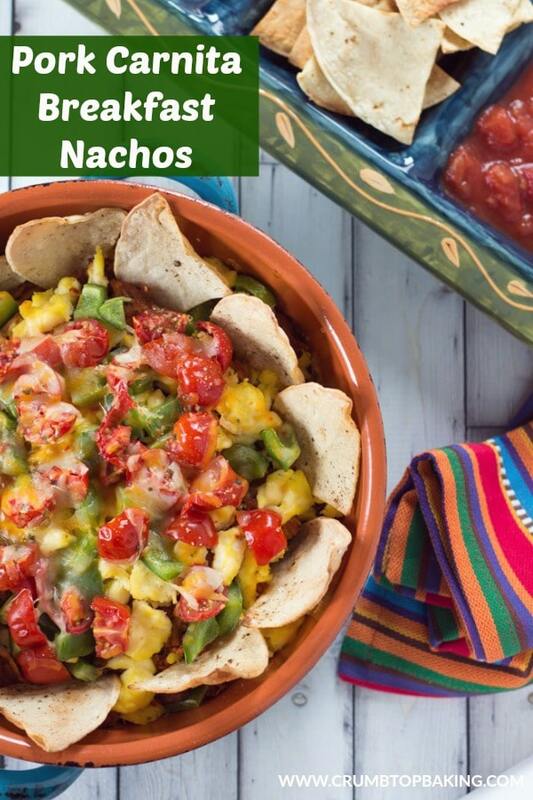 We enjoy these nachos for brunch all the time, but they’re great for dinner too. Super filling! I am in love with the idea of these Nachos for breakfast, Leanne – pulled pork is a favourite around here and I have never thought about making a breakfast from it. They sound so delicious for breakfast, lunch or dinner and healthy, too! I am also going to try those Sea Salt Lime taco chips! They sound addictive 🙂 Thanks for sharing such a colourful and enticing recipe. I look forward to making your recipe. Thanks so much Denise! We love pulled pork, so it seemed fitting to pair it with eggs and turn it into a fun breakfast nacho dish! And yes, the sea salt lime chips are really addictive! Let me know what you think if you make this recipe. Would love to hear your thoughts! Ok, I don’t eat meat but I would make this for Loreto and he would be in heaven! He just loves pulled pork and all those nice spices blending in with the lime juice. 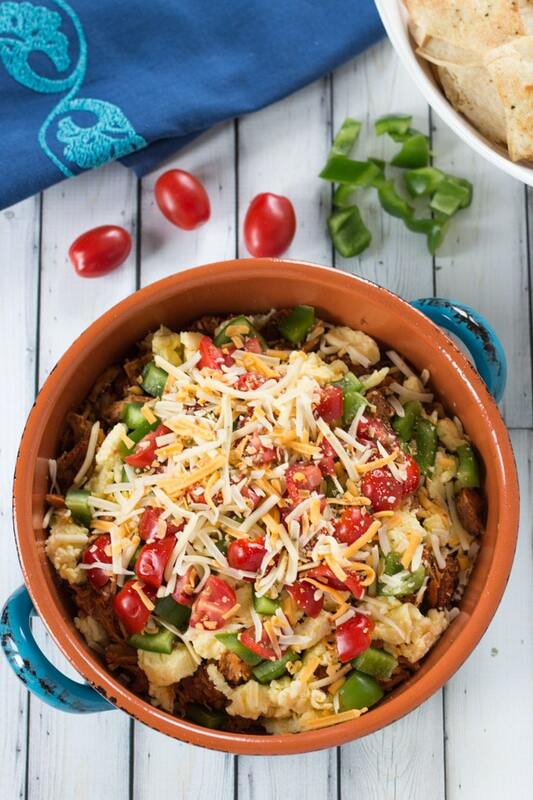 And then you have rice, peppers, tomatoes, eggs, cheese and tortilla chips… I’d actually love it, minus the pork 😉 . Thanks Nicoletta! The pork is pretty flavourful. It’s also my go-to recipe when I want to make pulled pork sliders or tacos. I think this dish could definitely work as a vegetarian dish. Just load up on extra eggs and veggies! I am obsessed with nachos, and the fact that I can have these for breakfast makes me their #1 fan!!! What a great idea Leanne! Thanks Vanessa! Nachos for breakfast is a win in my books too! Hope you have a great weekend! A thousand yeses to being down with nachos for breakfast! Oh my! Looks like you are totally weekend ready! Love these. Thanks Lily! 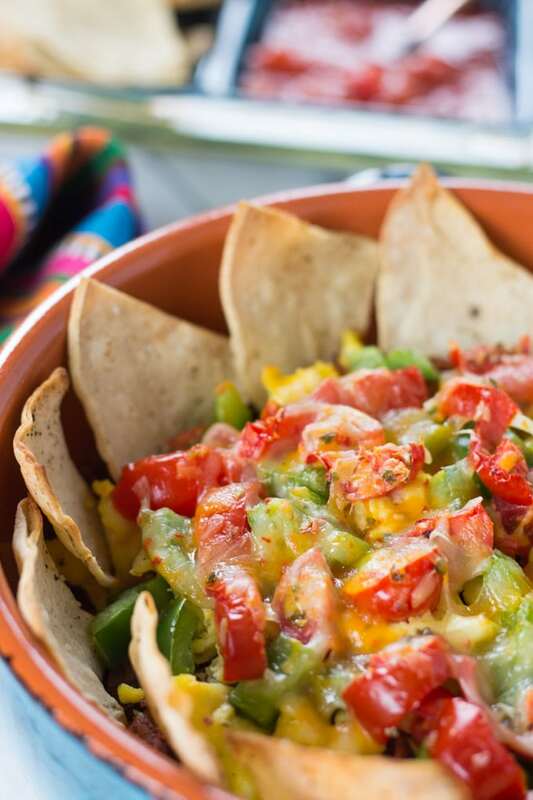 Gotta have breakfast nachos for a weekend brunch! ;) Hope your week is off to a great start!